Maunu delivered the spring commencement address on May 5 in the Barnett Center. 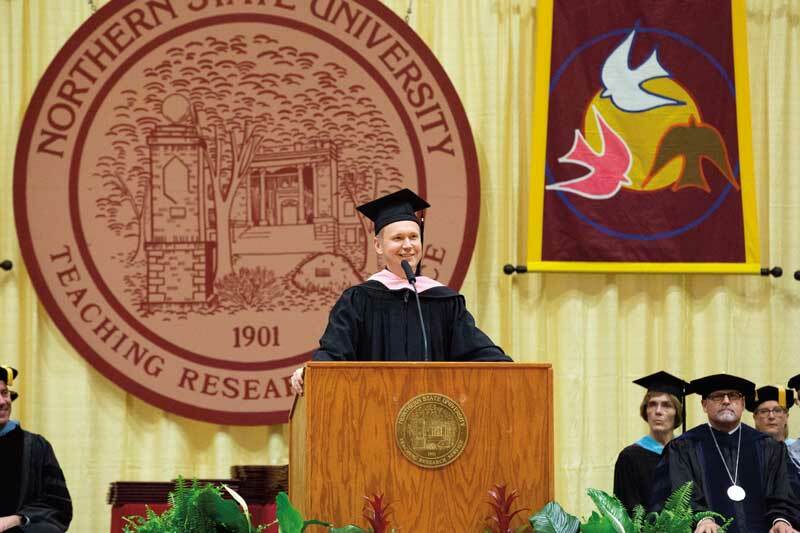 A 2003 graduate of NSU, Maunu received his Master of Music in Vocal Performance in 2005 from the University of Nebraska-Lincoln. He has been director of choral activities at Arvada West High School in Colorado since 2006 and has grown the program into a large, robust and high-achieving musical destination, resulting in nationwide recognition. Maunu’s efforts and successes also led to him being named a finalist for the 2018 Music Educator Award at the 60th GRAMMY® Awards this year out of thousands of educators across the United States. This prestigious honor is presented by the Recording Academy and Grammy Museum to recognize current educators who have made a significant and lasting contribution to the field of music education. Maunu also received a Commendation from the House of Representatives for his work in the choral field. At Arvada West, nearly 200 students have been accepted into all-state choir under Maunu's tutelage, including 34 in each of the last two years – the most of any school in Colorado last year. Most recently, the Arvada West Vocal Showcase choir was named one of seven finalists for the 2017-18 AMERICAN PRIZE in Choral Performance. They were also invited to perform at the 2017 American Choral Director’s Association National Conference, the most prestigious honor for a choir of any level in the United States. Maunu’s choir was one of only three high-school mixed choirs selected, performing alongside choirs from Europe, Asia and South America. His program is only the third high school in Colorado history to be invited to perform for the ACDA. Maunu and his ensembles have performed in Carnegie Hall; The Kennedy Center; Orchestra Hall in Chicago and Minneapolis; as well as High Mass at St. Peter's Basilica at the Vatican in Rome and High Mass at St. Mark's Basilica in Venice. A published author, Maunu has presented numerous workshops and clinics on men's choir recruitment, music program building and repertoire. He recently hosted the NSU Chamber Singers on their Colorado tour, presenting a joint concert and hosting a residency at Arvada West with the NSU students and Dr. Timothy Woods. Maunu said the student-faculty ratio was a big factor in why he chose to attend Northern. The highlight of his time at Northern was the community of the performing arts department.